We’re suddenly very much aware that we’re running out of holidays and that we’ve walked an awfully long distance in the last couple of weeks. So today was another Magic Kingdom day, taking in Splash Mountain, the Swiss Family Robinson Treehouse, Pirates of the Caribbean and Winnie the Poo. 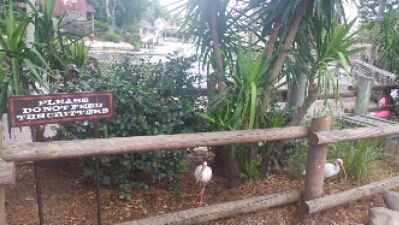 We also went on the riverboat and did a lot more character meets. I already knew it was going to be a bit of a strange day as I sat eating my breakfast muffin at the Cheshire Cat Café and watched Alice lead the White Rabbit by the hand to the Tea Cups. Some unkind comments in my Facebook stream suggested that I needed to check my meds, and that I was actually still sat at home while I hallucinated my holiday. All I can say to that is that if I were hallucinating, my brain wouldn’t be conjuring up this heat..! The evening meal was at Teppan Edo in Epcot – a traditional style noodle meal prepared at the table for a group of us. Service was excellent, the atmosphere that curious mix of formal and informal as you might expect at a Disney recreation of Japanese cuisine, and our chef witty and engaging while demonstrating some intricate knife skills. 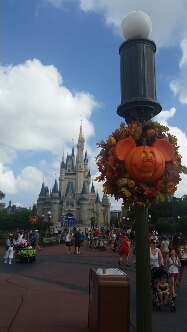 This entry was posted in family, holiday, travel and tagged Disney, family, food, Holiday, Magic Kingdom, travel. Bookmark the permalink.